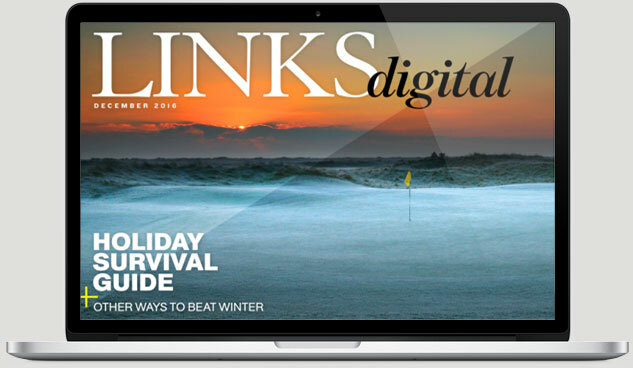 Not so long ago I clicked onto the LINKS Magazine website to check the ballot I’d submitted for the LINKS 100—the lists we launched a couple of months ago ranking the best courses in the world and U.S. (lists you too can vote on, and I urge you to do so). Anyway, looking over my ballot I was struck by something. Twenty-four of my top 25 courses were located in either the U.S. or the British Isles. But that wasn’t what struck me—what struck me was the 25th. I then checked the LINKS 100 ranking on that day (ours is the world’s only living, breathing list, shifting constantly as golfers cast their ballots). There it was—the same course—standing alone, the only “tropical” entry among the top 50—indeed the top 100—courses in the world: the jewel of the Caribbean known as Teeth of the Dog. I’d fallen in love with this siren 34 years earlier, when her charm and beauty competed with that of my wife, a tough assignment inasmuch as we were there on our honeymoon. 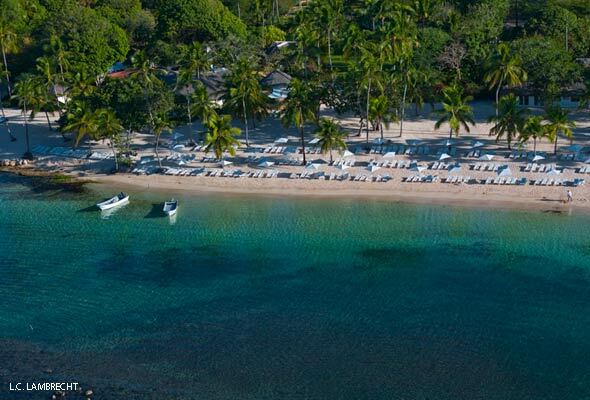 (Libby, for no particular reason, had fancied going to Haiti, and I, for a very good reason known as the Casa de Campo Golf Resort, had convinced her to try the other side of Hispaniola.) Three and a half decades later, we’ve still never been to Haiti but have returned to the Dominican Republic several times. It had been several years, however, since the last visit to Casa de Campo, and this time I’d returned on my own, to see whether the course I remembered so fondly was as good as ever and whether the resort had aged as gracefully as had my good wife. One of the allures of the DR, especially for East Coasters, is its easy accessibility, just a four-hour flight from New York and barely two hours from Miami to the La Romana airport a few minutes from the resort. The last time I’d been to that airport it was little more than a thatched-roof hut on a landing strip, staffed by a handful of somnolent customs officials. Now it’s a bustling international terminal. My American Airlines flight arrived moments after two jumbo jets—one from Europe, the other from Canada—and several hundred passengers descended on the terminal simultaneously. In the old days, that would’ve meant an exasperating hour plus in the thatched-roof hut. This time, I was out the door and on my way in 15 minutes. 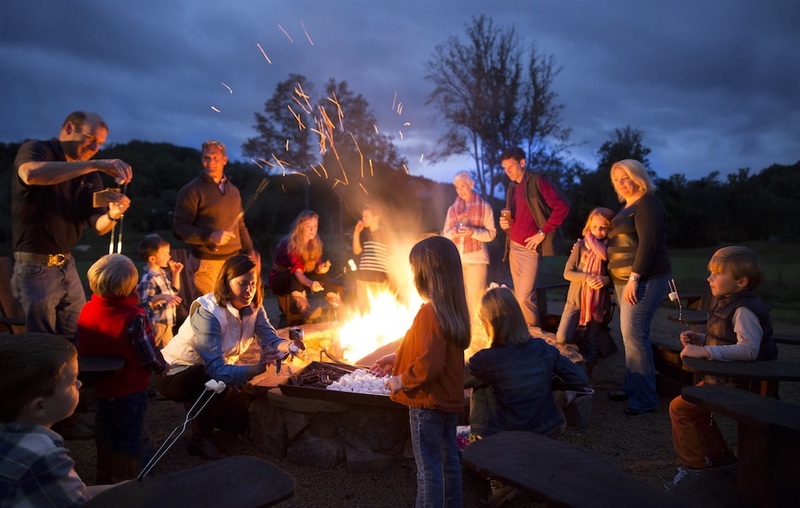 That happy experience was the harbinger of a thoroughly updated Casa de Campo. Each of the resort’s 265 rooms has been refurbished and redecorated in a sort of urban-chic style with enormous bathrooms and all the digital-age necessities—high-speed wi-fi, plasma TVs and Blu-ray players, clock radios with iPod docks, even espresso machines. It’s all part of a $40-million dollar facelift that also brought a new indoor/outdoor bar and lounge, three swimming pools, a fine-dining restaurant, business center, library, and fitness center. One thing that has not seen much change over the years—thank goodness—is Pete Dye’s seaside masterpiece. Oh he’s lengthened a few tees, reshaped a couple of greens and bunkers, added a shouldering mound or two, but Teeth of the Dog remains just as it was at birth—one of the world’s most beguiling places to play golf. Accompanied only by my caddie JJ, a polished Dominican grandfather with more than 30 years of looping at the resort, I set out on a warm cloudless morning, brimming with optimism that the course would inspire my best golf. That didn’t happen. 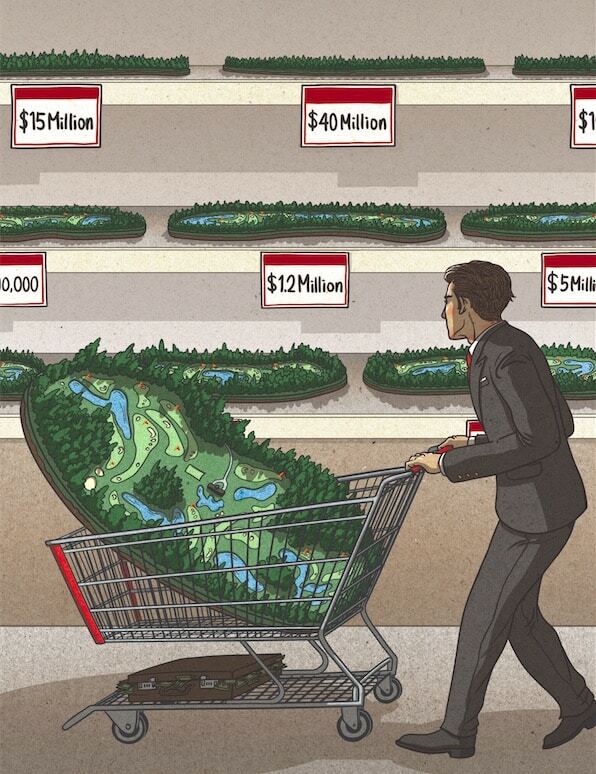 But no matter—this is one of those rare courses—Pebble Beach, Pacific Dunes, Turnberry, and Castle Stuart also come to mind—that is a wonderful place to play badly. No amount of ineptitude can lessen the rapture. In no time, I was five over, thanks to some crisscrossing of Dye’s evil little plateau green at the par-five 3rd. When I came to exquisite little No. 5, the first of seven holes that skirt the Caribbean, a honeymoon memory returned. 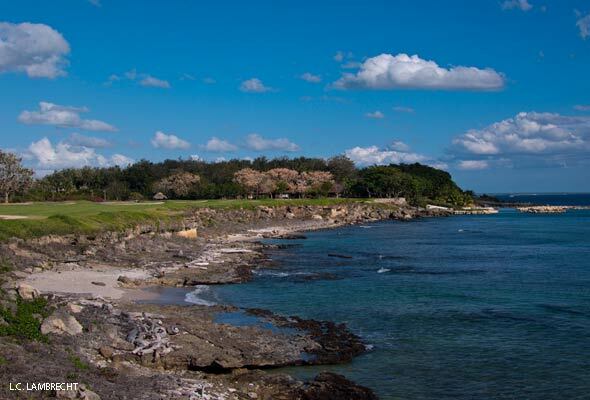 This was where Libby had made the first par of her life—her comprehensively yanked 5-iron, which had seemed headed out to sea, instead bounced off a foam-frothed rock and onto the green. After hitting her 20-footer 10 feet past the hole she sank the comebacker. Smiling at that recollection, I managed to find the green myself and got through the rest of the front nine with just one bogey. The stretch from Nos. 5 through 8—two par threes and two par fours played with the sea literally splashing at your ankles—is about as exhilarating as golf gets. There had in fact been one major change to Teeth of the Dog. The green surfaces had improved tremendously. Years ago, they’d ripped up the old bermuda grass and introduced seaside paspalum, the drought-resistant strain that thrives on saltwater and provides a surface almost as smooth and fast as bent or rye. Once furry, slow, and full of pockmarks, the greens now were worthy of a Tour event. Like the front nine, the back starts a bit slowly and builds to a crescendo. My memory blessedly failed me at the 14th—not until after I’d hit a good downwind drive and squeezed a 5-wood onto the front of the green did I realize the hole was a par five and not a long four. This would be my only birdie of the day, as on the next three holes—stretched spectacularly along the sea—I let my focus and golf ball wander a bit. 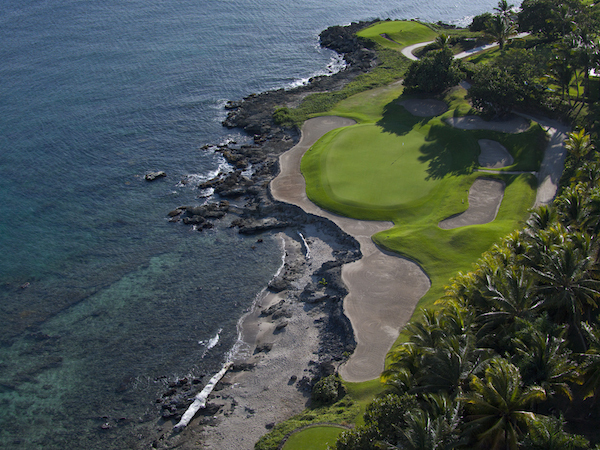 In addition to Teeth of the Dog there is another 45 holes of Pete Dye golf at Casa de Campo. The Links—an unfortunate misnomer since it neither looks nor plays like one—is an inland layout where Dye created plenty of interest, with stern and occasionally brutal bunkering, lakes and lagoons in play on five holes, and humpy-hollowy green complexes that test the short game relentlessly. Sadly the course was under renovation during my February visit, but is open now, and the best news is that now The Links also has those velvety paspalum greens. Speaking of odd names for courses, the other 27 holes are known collectively as Dye Fore. The original 18 debuted in 2001 and is comprised of two very distinct nines. The Chavon sits on high ground beside Altos de Chavon, a hilltop village built by stonemasons to resemble a Tuscan medieval town. Seven of its holes run alongside a cliff that drops 300 feet to the Chavon River. Although completely different, the experience here is almost as enthralling as Teeth of the Dog. The heaving fairways are enormous and so are the greens, a bit like the Kapalua Plantation course in Hawaii and for good reason as the wind is generally strong—stronger than beside the sea—especially in the afternoon. Which is why I played in the morning. Still I had my hands full, even from the 3,320-yard blue tees (the tips stretch to a mind-warping 3,921). 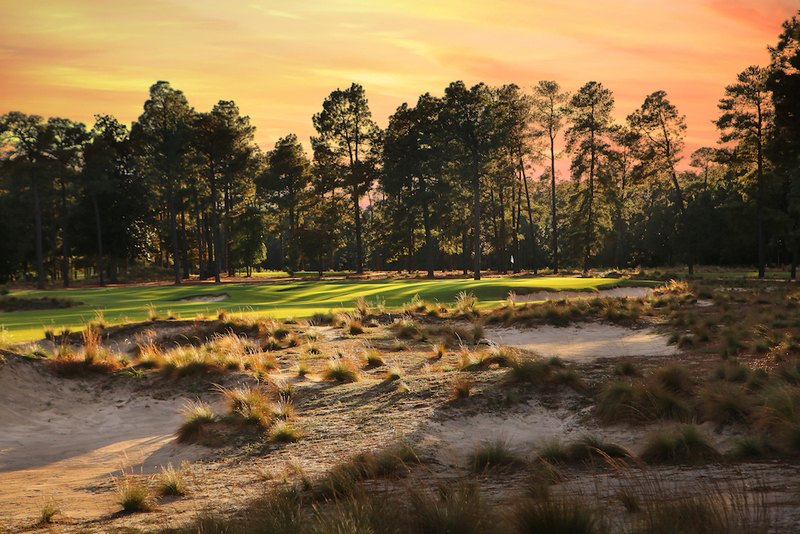 The best and toughest holes are surely the par threes, Nos. 3 and 6, each calling for a courageous shot across a chasm, and the most vexing may be the 9th, a roller-coaster par five with a volcano green that’s about as welcoming as a Parisian waiter. I won’t divulge what I made on that hole, but I will say that a smile returned to my face at the 1st hole of the Marina Nine, a short (520-yard) par five where the score I wrote down was precisely half the number I’d recorded moments earlier. The Marina, as its name suggests, meanders down toward a harbor packed with obscene-size yachts and ringed by restaurants and shops. The views are arresting, especially at the 4th and 5th, a pair of downhill doglegs, but my favorite was the par-five 8th which winds uphill toward a classic Pete Dye green, half hidden among hillocks. Remarkably, there is no water in play on either of these nines, but never is it needed to enhance the challenge or aesthetics. Where it was needed was in the third nine, opened just a few months ago, and Dye delivered, crafting the ominously named Lakes. On difficult terrain—rocky flatland that could be in the Arizona desert—the Lakes makes its case immediately with a rightward dogleg that hugs a man-made lake from the landing area to the green, then follows up with a par three where the tee shot must be struck well and truly or the likely result will be a splash. Variety marks this nine. Hole No. 3 snakes 590 yards from the back tee through a minefield of bunkers to a devilish semi-blind green; No. 5 plays downwind to a tiny tabletop—another one of those cone-shaped greens that strike fear whether approached from 200 yards or 50 feet. The 6th is a lakeside par five where the green is tantalizingly within reach after a big drive, but so is disaster. Those who escape that hole unscathed will do well to also survive the par-three 7th where the assignment is anything from a mid-iron to fairway wood over water, invariably against a stiff crosswind. Indeed, when the breeze is up, the new Lakes Nine is surely the sternest stretch of the Dye Fore triathlon. Battling the Casa de Campo courses, one can work up an appetite, and as with the golf there is plenty of variety, whether within the stone walls of Altos de Chavon, alongside the busy marina, or at Minitas Beach where the Maccione family of New York’s Le Cirque fame serves gourmet cuisine amid the swaying palms. In all there are 20 different places to eat and drink. On my first night I stayed close to home at La Caña, the new restaurant a 9-iron from my room, and was also unadventurous with my choices—Caesar salad and a steak. I didn’t expect them to be up to Manhattan standards, and they weren’t, but they weren’t far off either. The 19th Hole, overlooking Teeth of the Dog’s final green, offers a selection of excellent sandwiches which I would recommend washing down with a cold Presidente, a local Dominican beer which happens to be superb. The Le Cirque restaurant seemed just about the most romantic spot possible to have dinner, but since I was solo I went instead to La Casita at the marina and enjoyed excellent Spanish-style cuisine while watching various members of the international mega-rich berth their yachts. For my last night I opted for room service, and for a very good reason. It was Sunday night—Super Bowl Sunday night—and my New York Giants were about to take on the Patriots. So after a 36-hole day I hunkered into my man cave, flipped on the 42-inch flat screen, and settled in for what turned out to be a very satisfying three hours, interrupted only by a waiter delivering nachos and a cheeseburger. My return flight was late the next afternoon so I had time for one more round, and there was never a question where it would be. With JJ providing encouragement and reading the greens, I managed to squeak in with a 79 on Teeth—by several strokes my best effort of the trip—thanks to a tee shot at the par-three 16th that stopped less than two feet from the hole. It was the perfect finale for a trip that had confirmed Casa de Campo had lost none of its luster, indeed had added to its allure as the best golf resort in the Caribbean. As for Teeth of the Dog, well when I first played it 34 years ago I deemed it one of the 10 best courses I’d ever played. Back then, I’d played about three dozen courses, all but a handful of them in the U.S. Now (and yes, I’ve kept count) the list is 652 in 35 countries. So where does Teeth of the Dog rank on that LINKS 100 ballot of mine? Solidly at number nine.